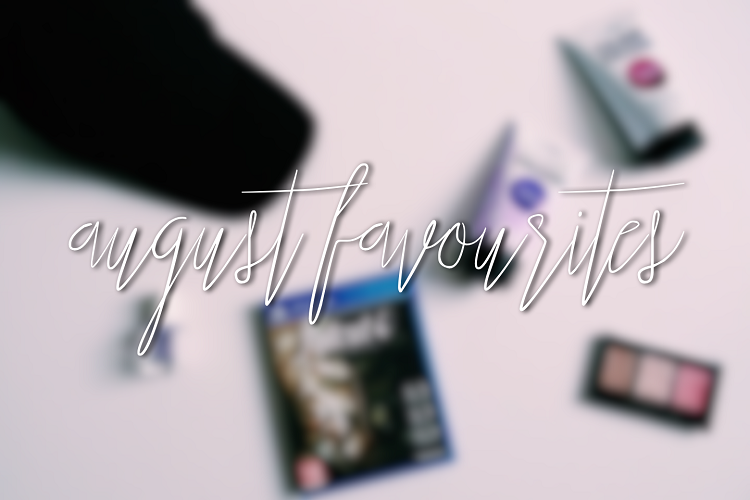 Today I wanted to write an August favourites post. Can you believe I've never actually written a favourites post before? Let's get into it. Okay, this game is a big reason why I haven't been blogging all that much lately. It's just so good! I know I'm pretty late to hop on the Fallout train, but at the beginning of the summer my dad got a PS4, and for the last two months or so I've been borrowing it to play Fallout on. I'm addicted. I love the story, I love some, but not all the characters, and am trying to play as many side quests as possible to I can eek out the main story for as long as possible. I really don't know what I'm going to do when I finish this game. Remember this old chestnut, I wrote a post on it way too long ago. It used to be a staple in my makeup routine but I'd gradually gone off of it due to the highlighter. It's a very shimmery highlighter, and for a while, I was into matte highlighters. Well, guess what, it's all changed. I had a wedding to go to in early August (Hey Uyen if you're reading) and I wanted to go glam. This, my friends, is when I rediscovered this highlighter and just how amazing it is. It is so shimmery! It's perfect! My old palette is definitely getting a well deserved second lease of life. If anyone has any other great highlighters they would recommend, please do tweet me! I'm hooked! I headed up to Leicester for a long weekend in August to visit some friends, and of course, what would a long weekend be without some shopping. I've been eyeing up baseball caps for a little while now. I hadn't found one that I liked, and I wasn't too sure if they suited me. I popped into New Look, not even looking for a hat, and bam, there was this one. It's become an instant hit and I wear it as much as I can. My friends haven't refused to hang out with me in public either whilst I'm wearing it, so I guess that's a good thing. I'd been meaning to dye my hair for ages. I'd had an ombre kinda vibe going on for a good few months, but wanted to dabble with pink. I'd tried Manic Panic, which made the very lightest shades of my hair turn a very subtle pink, but it wasn't enough. I wanted more! 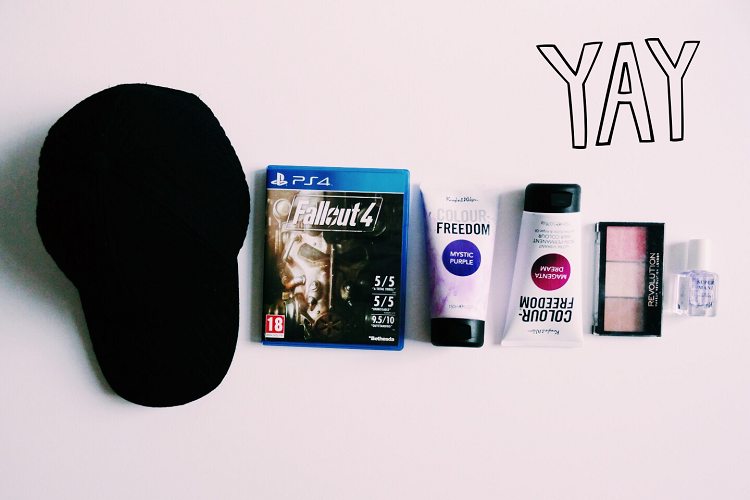 I went into Superdrug and bought these dyes on a whim. I wasn't sure what colour they would show up on my hair, I wasn't sure how well they'd last. But I did it. Enter, Becca the mermaid. I love them! They're so easy, just stick some in a bowl and dilute or just slap it straight onto your hair. The first few washes were the most vibrant, but even when the colour starts to fade it doesn't seem to go too patchy. The purple definitely has a much stronger pigment, but I think I prefer the pink. Definitely contemplating getting a teal shade to mix into my mermaid hair. Last but definitely not least, it's Barry M's Super Mani. It's a 7 in 1 treatment and I am so impressed with the results, My nails can grow quite long, but they're so bendy and look really warped half the time. It's super annoying and I hate how they look. I bought this on a whim, I didn't really expect it to do much, but with a regular application it has actually made a difference! It doesn't stop my nails bending completely but they're so much sturdier, and they've been growing a lot longer before they break! It's become a staple now every time I paint my nails. I find it applies easily and is actually a pretty good base coat if you're being lazy. I want to try the rest of Barry M's nail care range now! That, my friends, sums up my absolute favourites this month. I really enjoyed this post, and hopefully, you did too. You might see another one pop up at the end of September. Only time will tell!